I kinda liked Super Smash TV, it was bloody difficulty, but if you were in the zone, and everything just “clicked” it was bloody fun and a hell of a laugh. So what would Acclaim do to follow that great game up? Well, them being a lazy game developer they pretty much reskinned Super Smash TV into a Faux-Schwarzenegger commando type military shooter in the vein of MERCS. Ok, so this all has to be taken in good humour, as it is a joke, and they ran with the joke. The evil General Ackboob, a middle-eastern dictator who talks gibberish, closes off his country to the outside world. Idiotic news reporters flock en masse to get the “scoop”. 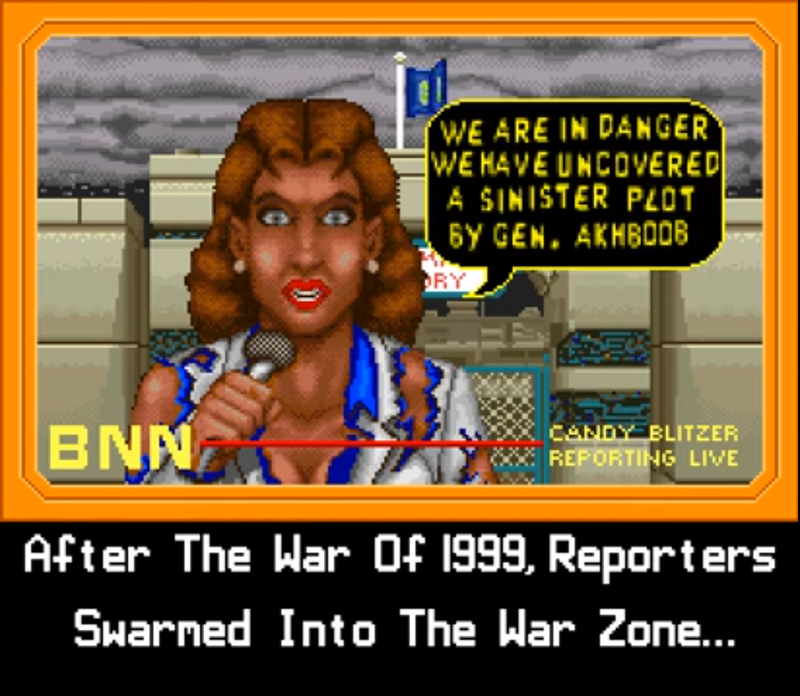 One lucky reporter discovers that the Baby Milk Formula Factory, is in fact a Bio-Weapons Factory, and that General Ackboob may or may not be the devil. Ackboob takes all the reporters hostage, and it is up to you to free them. 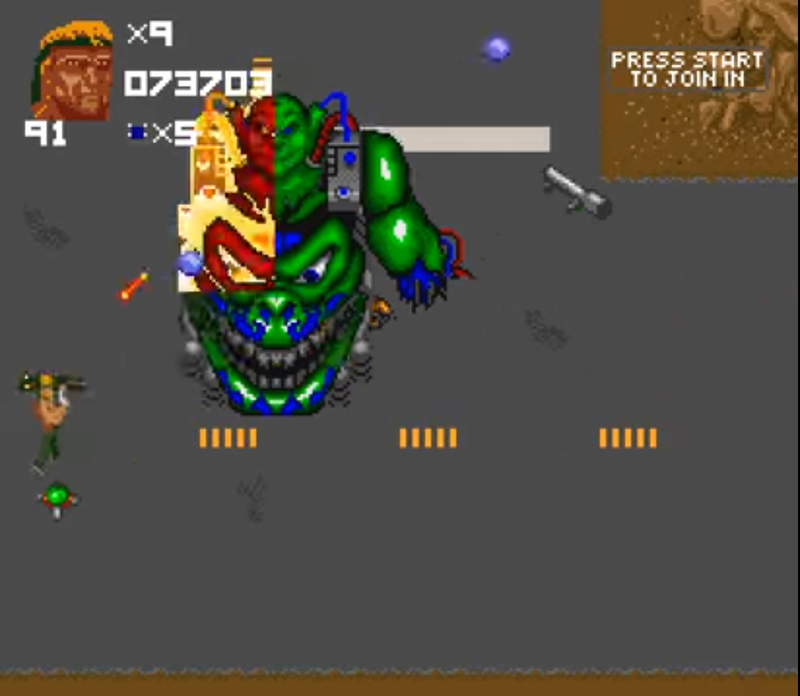 Enter Captain Carnage (player 1) and Major Mayhem (player 2), who go about running and shooting almost everything that moves across three fairly badly terribly paced levels. To be honest, this appears to be the plot to an episode of South Park (A Ladder to Heaven), though this game came around 10 years earlier than that particular episode. The humour is very hit and miss, not in a Z “really dated” kinda way, or a Duke Nukem “actually totally awful and I don’t know what we were thinking in the 90s” kinda way, but the humour is childish and didn’t really do anything for me. Since the humour is the core aspect of the game if it annoys you you’re losing a significant chunk of the gameplay. If you have played Super Smash TV then this is a spiritual successor, it is a run and gun, multi-directional shooter. This means from a top down 3/4 perspective you run around. You can shoot in directions according to the buttons on a SNES pad, meaning you can shoot in 45degree increments in a 360 degree arc. Super Smash TV was hard. Total Carnage is frankly unfair at times as there is an unforgiving RNGesus. While enemy routines are fairly easy to figure out, the item drops and random bomb drops make a lot of these sections unfair. 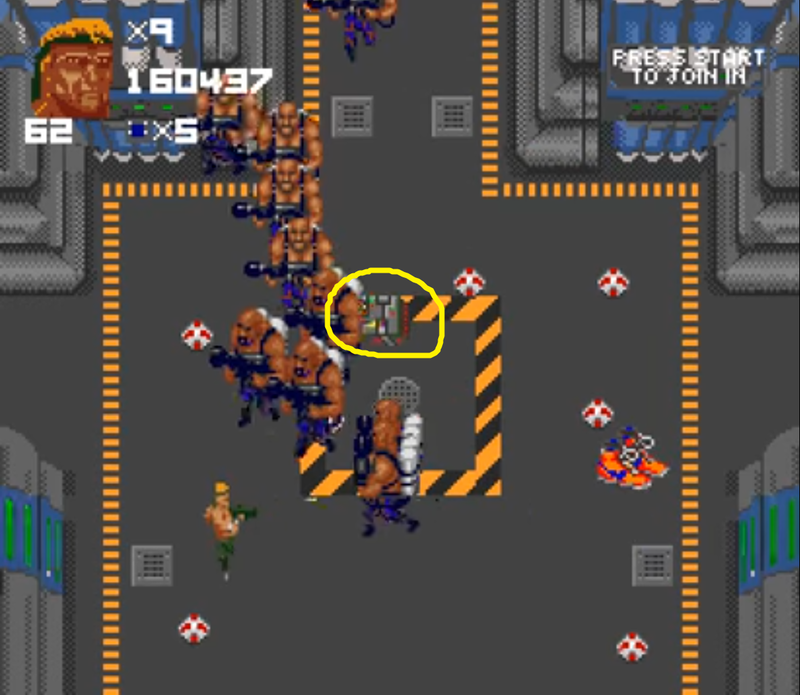 Some items will appear for 2 seconds on the other side of the screen, so you ain’t picking them up. But bombs which kill you appear out of range, or in an impenetrable horde of arseholes. So while the standard levels can be beaten with skill, there are some cheap lives lost due to evil RNGesus which is ery frustrating. Sigh… These go on for too long again. I complained that the bosses in Super Smash TV having about 8 forms, and that 6 of these forms were unnecessary, Total Carnage bosses seem to have about 10 layers you need to peel away. 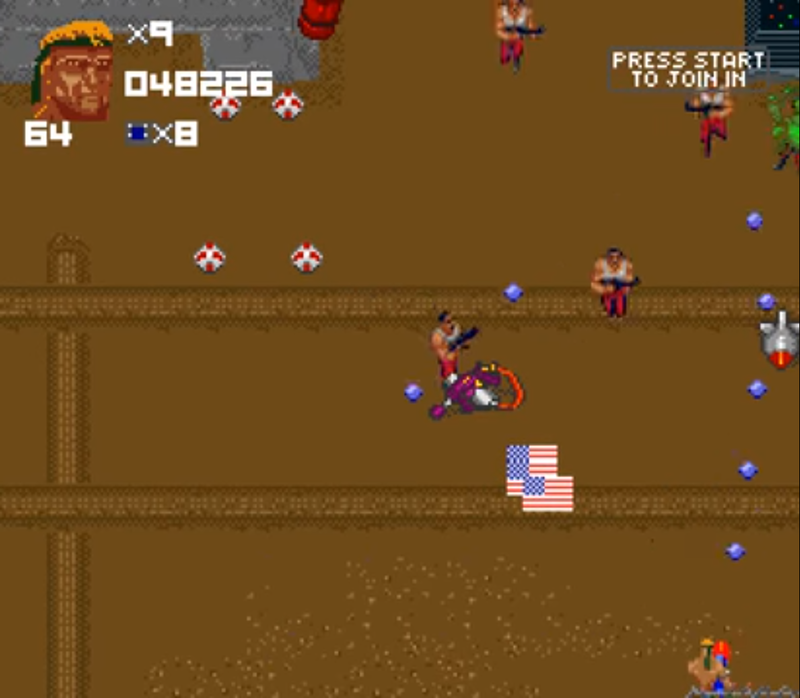 It means again, that the levels are badly paced as you can get to a boss in 5 minutes, but then spend 5-10 minutes shooting a boring bullet sponge. You then also have the issue that the bosses will have roughly 15 different attack patterns, and some of these cause RNG issues. If he chooses to jump a certain direction and fire two homing missiles? Just put the pad down, and let yourself die. If he switches to flame throwers and you’re in the bottom third of the screen, put the pad down, your going to die. All moves are dodgeable on their own, but the randomness/unpredictability of these attacks means you’re most likely going to burn through lives. I can get to the first boss without losing a life, but tjen lose 20 at the boss. The first is that it is more of the same as Super Smash TV and if you love Super Smash then you will love this. The second, is that… it is more of the same as Super Smash TV, and you loved Super Smash TV, but you don’t need a reskinned version of it without the same charm. If you have a friend, play in two player, but at about 80 minutes for a complete run, and only 3 levels, the game is awkwardly paced and the final boss literally takes 20-30 minutes. One final thing, it wasn’t until I started getting screenshots that I realised the game was really bland, with boring monotonous backgrounds. 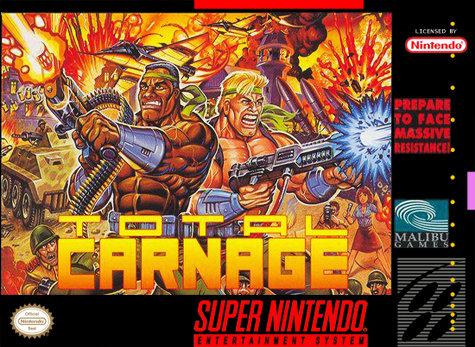 Total Carnage was described as the best game of 1992 for the Sinclair by Sinclair User, but only got a 3.2 out of 5 from Nintendo Power. Not many reviews seem to exist, but it currently holds a 61% on GameRankings. The RNG frustrations are one hard part of trying to play older games, especially for people that didn’t play back then that can at least deal with the “nostalgia”. Nice review! Yeah the RNG is insane in some games, I can beat Super Smash as while there is an RNG it can be fair and you can see your mistakes. In TC it just feels unfair at times with many sections you simply can’t do anything about. I remember playing the demo for this over and over on PC but I never played the full version. No big loss clearly!